100-Channel True Diversity wireless instrument system for guitar, with carrying case. The CenterStage Satellite -100 is a revolutionary compact wireless system designed specifically for instruments (guitar, acoustic guitar, bass, horns, violin, mandolin, or any other instrument with a pickup). With 100 user selectable UHF frequencies, the Satellite -100 offers clear-channel operation with up to 300 ft. range (without obstructions). The mini pedal size receiver connects directly to your amplifier, interface, pedals, or mixer. For electric guitar, bass, or any instrument with an input jack, the Satellite is available with the SMGT-A instrument transmitter featuring a 30° angled 1/4 in. plug (for use with recessed or surface mounted jacks) or the SMGT-R transmitter with a 90° angled 1/4 in. plug (for use with side mounted jacks). 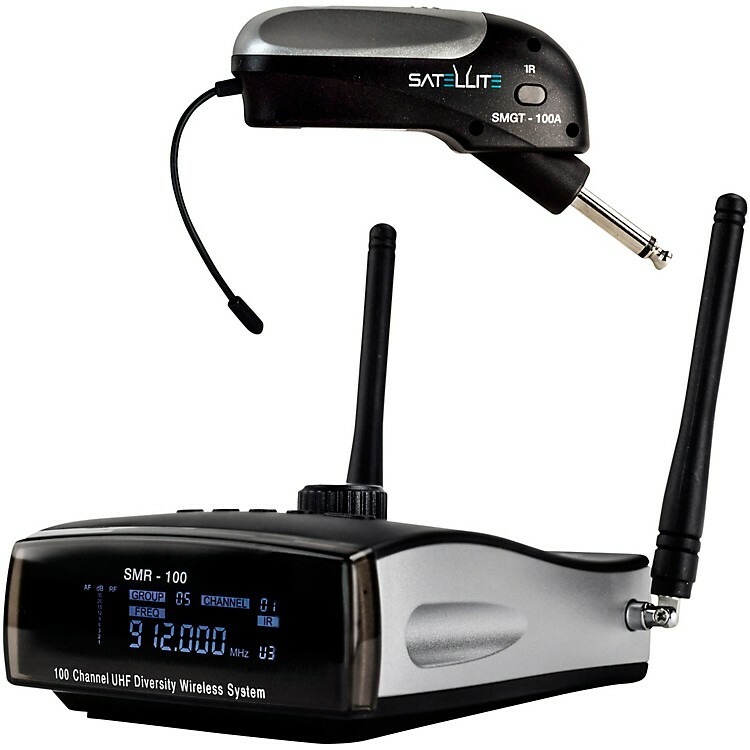 For wireless use with horns choose the SMHT transmitter, and for acoustic guitar, mandolin, violin, or an acoustic based instrument choose the SMBP with the optional GT-10 or GT-20 microphone. With the included reinforced aluminum case, all Satellite -100 system components and kept safely in one place.